NOTIS is proud to welcome poet, author and translator Lyn Coffin, who will provide us a "translation retrospective" and discuss her career as a literary translator from Georgian, Russian and other languages. All are welcome! 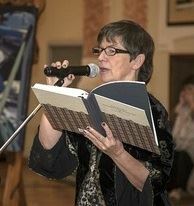 More than 30 of Lyn Coffin's books have been published, by W.W. Norton, Ithaca House, Abattoir Editions and others. She has received awards for her own writing and her translations, and she has seen her work translated by others. She will discuss her introduction to the world of translation decades ago and the high and low points in her career since then. Time for questions and answers will follow. More information about Lyn is available on her website.